It was bound to happen. 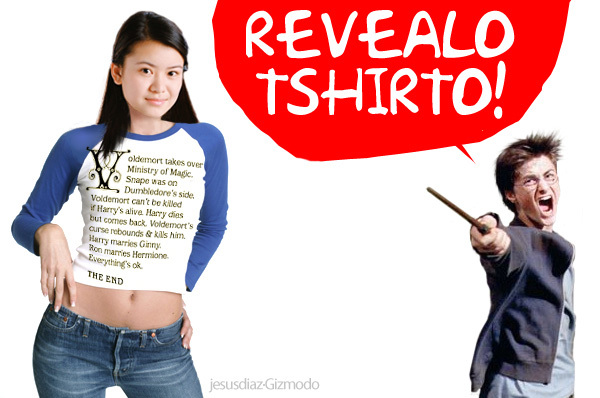 Gizmodo posted this item for sale at the Harry Potter Plot Enlightenment Project. I'm seriously tempted to get this shirt. Its bound to get a few stones thrown at you if you're a potter fan and have yet to read book 7. Ahhh Hairspray read my previous post. If you don't like musicals, you most probably won't watch this show, but if you do like them then don't miss this one. 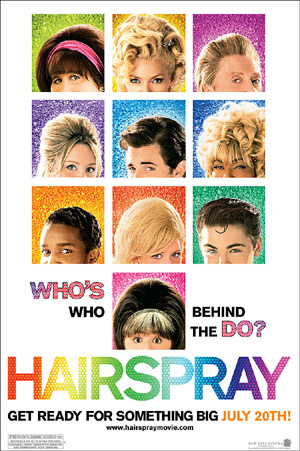 Its an excellent film adaption of the live musical and retains the loud campy fun feeling of the musical. Ahhhh yes. 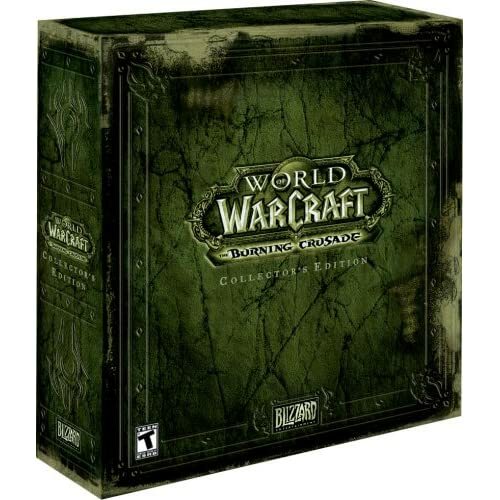 July 21st 2007 is when the book was released and I spend Fri - Sun rereading book 6 and just completed book 7. Amazon did an awesome job delivering the book on Saturday and even the box is customized just for Harry Potter as you can see in the picture. SO!! Was it worth the wait? Is it as good as the previous 6 books, were there twists and turns that we didn't expect? YES, KINDA, Depends. This final book more so than any of the others proves that the Potter books might not be suitable for younger children. Remember when J. K. Rowling write the books she meant for her audience to grow with the books. 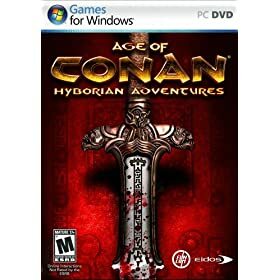 So the kids who started reading book One 7 years ago are now about 17 and older. This does not however help new kids who are currently reading Book 1 and expect to devour all 7 books in one go. There are themes in book 7 which rival most other existing fantasy sci-fi novels with respect to loss, death, sacrifice. Make no mistake, Book 7 is NOTHING like the first 3 books and much darker than the last 3 books. It is not as fun to read as there are very few light hearted moments. This book truly is dark. So what keep you reading? Finding out what happens to Harry of course. The first quarter of the book is pretty fun, but chapters 9 - 25 is dark and depressing. But fear not chapters 25-35 will redeem the book and starts building up to the finale which is quite satisfying. And kudos to Rowlings on the addition of her epilogue. While the ending was satisfying, the addition of the epilogue is almost like a tribute to her long suffering readers and bring closure to the whole Potter Saga. Yes I'm being deliberately vague so as not to give away anything. Let's face it if you're a potter fan you've probably already got a copy of this book, or soon will. If you're not, this review isn't going to change your mind. While reading this final book, I kept imagining how the movie version would play out. Kept imagining Daniel Radcliffe and Maggie Smith and Robbie Coltrane reprising their roles. For although the saga of Harry Potter is finally complete, we still have the final 2 movies to look forward to. So what parts would I most love to see in the movie version of book 7? 1. The Wedding of Fleur and Bill. 2. Seeing Maggie Smith rallying up the whole of Hogwarts and dueling Snape. 3. Seeing flashbacks of Snapes life. 4. The awesome battle at Hogwarts. 4. The final battle between Voldermort and Harry. 5. Please please please include the epilogue. To see them all grown up 19 years later and sending their kids off to Hogwarts is just so so satisfying. Hehehe check out this Simpson Site! 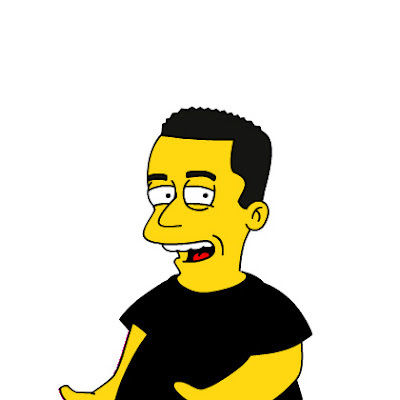 Just upload a pic of yourself and it creates a Simpson char of you! What do you think? Is it me? Ahhhh.... Pixar does it yet again. The only Pixar movie that I've missed has been Cars, Aside from that I own every other Pixar movie released. Ratatouille is yet another diamond in their already gem laden crown. 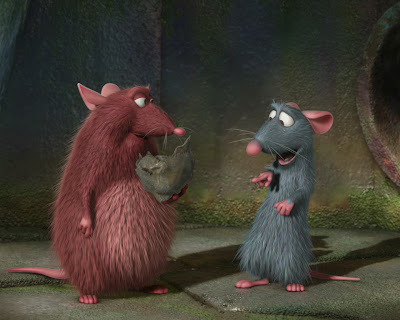 Ratatouille follows the antics of a Rat who unlike his peers, has a love and talent for food. Good food. Gourmet food. He ends up hooking with a kitchen challenged boy and together they produce masterpiece after masterpiece and elivate the restaurant to 5 star status. Of course no Pixar movie can be complete without the villan, and here we have the ultimate food critic who's out to destroy the restaurant. 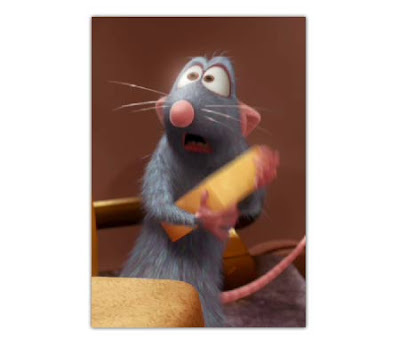 Ratatouille might be more suitable for older children and adults because I'm not so sure how younger kids relate to Gourmet food. In my experience, kids HATE Gourmet food, have you tried getting a kid (who is not Japanese) to try sushi? or frog's leg? Still there are many moments where the show will win over the younger audience and being a foodie myself, I absolutely loved the show. It also occured to me that for the younger generation, Pixar is to them what Disney is to many of us older folk. After all who released all the most popular cartoon/animations in the past 10 years? Ah well, if you want a fun light hearted show, I highly recommend Ratatouille. I give this show a 4.5/5. I'll post a spoiler free semi review of Harry Potter. For a full review of the show, I highly recommend the Geeks of Doom review. They summed up my opinions almost to a T, so I won't go over it again. I watched the IMAX 3D version of Harry Potter and the Order of the Phoenix. Aside from the HUGE screen at the IMAX, the 3D part of the experience came at the last 20 mins of the movie. 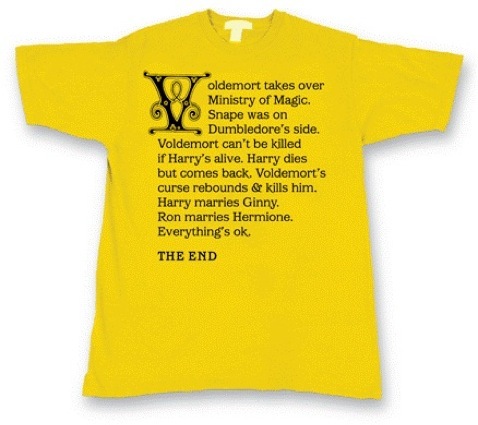 If you've read the books then you know what part was put into 3D. I loved it. 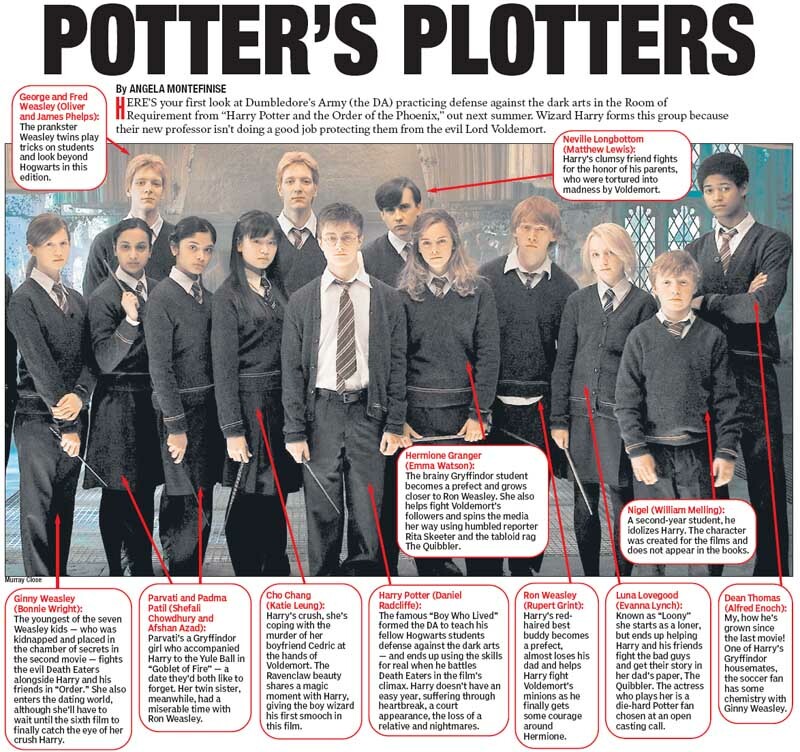 David Yates, the new director is a genius!!!! The story is faithful to the book but because of time constraints changes parts of the book and sequences of events. There's a very noticible improvement in acting from Rupert Grint, Emma Watson, and especially Daniel Radcliffe in this movie. The movie also conveys Harry's anger and resentment much better than the book did I think. Also after you watch the movie, go back and reread the last 100 pages of the book. I found the movie was much clearer about what happened between He who must not be named and Harry. Bottomline, if you've been following the series (books or movies) this is a must see. My only complaint is that so many parts were cut out to concentrate on the main plot. PS. Kudos to Imelda Staunton who plays Dolores Umbridge. She's perfect for the role and such an evil villan that you just want to smack her! PPS. Doesn't it seem like just about every english actor of note is in this movie? Hmmm.... think there's a part for Hugh Grant? I give this movie a 5/5. FINALLY!!! SciFi channel has shown the 1st episode of Dr. Who Season 3. 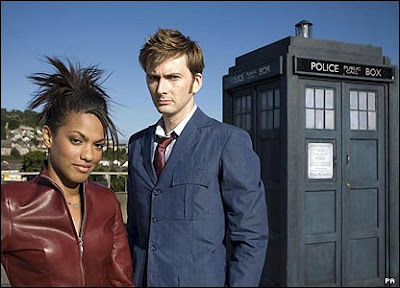 David Tennant's back and his new sidekick is Freema Agyeman. For those of you who thought that Dr. Who was a little too "light" and not serious enough you'll want to keep tuned for Season 3. In particular episode 9 "The Family of Blood", and episode 11 - 13 "Utopia / The Sound of Drums / Last of the Time Lords". You want drama? You'll get it in spades! And Captain Jack's back for episode 11 - 13. Yessir! I've already seen the entire series online and it is the best season of Dr Who yet, I'll still tune in to SciFi Friday's because watching Dr. Who online isn't quite the same as watching it on a full length TV. Oh and here's a little spoiler. Dr. Who's getting a new companion for Season 4. Its Catherine Tate who played Donna the bride in the Christmas Special. As for Freema, all we know right now is that she'll join up again mid-season 4. No confirmation yet if she's only guest starring or will continue on as a companion. PS. Torchwood (The Spinoff starring Captain Jack) is coming to BBC America on September 8th! I had Punch Pizza today. 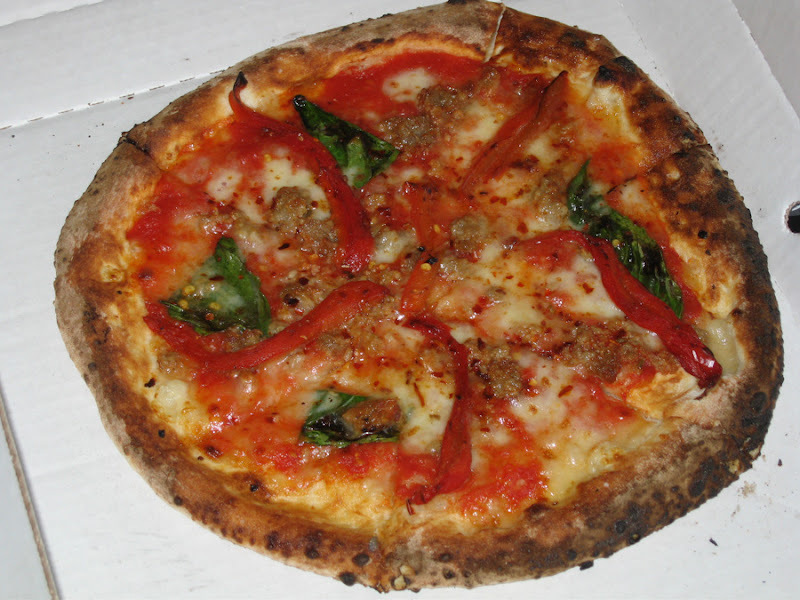 If you've never tried it, its a chain in the Twin Cities that specializes in more exotic (or frou frou) pizzas. For example Spinach and Gorgonzola cheese, more authentic to what I suspect is common place in Europe. The best part is each Punch Pizza has a huge wood burning oven which cooks the pizza in about 5-7 mins and the taste is very distinctive. 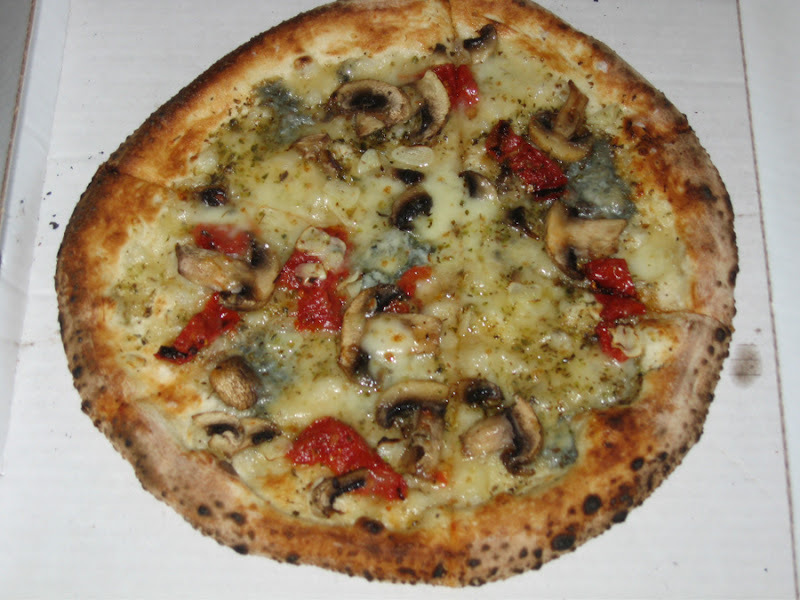 The pizza's are lighter and much less greasy than the usual Pizza Huts or Papa John's. Definitely a place to try if you ever come to the twin cities. When I first heard about a live action movie of Transformers several years ago I was not on the band wagon. 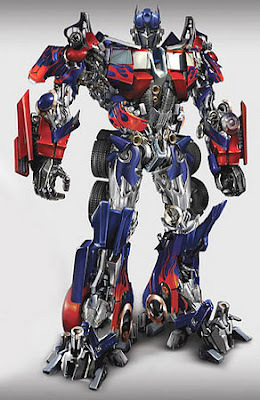 In fact, my first thoughs were Transformers? Didn't that go out of fashion in the 90's. Who the heck in interested in Transformers now? But as time went on and I started seeing stills of the show, I started getting very interested. And when the full traillers of the movie started appearing, I was now fully on the band wagon. So naturally I had to catch the first showing of Transformers at 8pm on Monday. I'll keep the review of the actual movie short. Its good. Its very very very good. This is the kind of action show we expect for the 4th of July weekend. I would say that this is Michael Bay's best show. 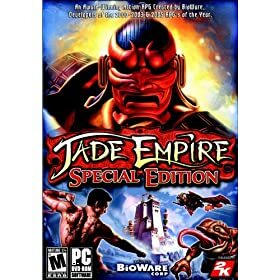 There's lots of amazing special effects, Industrial Light and Magic (ILM) truly are the top of the heap when it comes to special effects and this movie just cements their crown. The acting is solid, the show doesn't take it self too seriously which is evident from the many funny moments but under it all is the battle between Autobots vs Deceptercons, with the human race as a backdrop. I give this one a 5/5, a perfect summer action blockbuster movie. Its the 4th of July and here's some cute cartoons to pass the day away.